If you prefer to mail and/or telephone your order in, please feel free to download the order form PDF and print/mail/email it after marking your selections. Enter the transformational world of Merinda and the Magic Mirror. See how you can empower and heal yourself to become who you really want and need to be! This fable teaches how to find your voice and your authentic self. Merinda discovers that bullies don't have the power to rule her life. Like Merinda, you can embrace the amazing freedom that comes from really understanding how being true to yourself can transform your life. Your Magic Mirror, the special journaling and guided meditation section, guides you through this journey of self-discovery. If you don't have a teacher the path of self-awareness can become difficult. That is why I have developed this Centering Tools Home Study System. 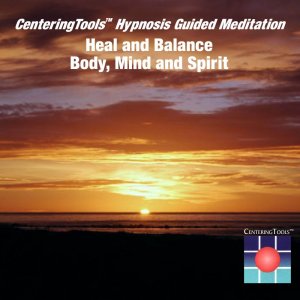 The content of the Centering Tools Workbook and Audios to Heal and Empower Yourself and Create Your Best Future comes from my twenty years of experience. It’s my best advice for creating a whole new you. I’ve faced numerous challenges over the last twenty years. Through my own self-enlightenment and studying the greatest self-help masters I created solutions to the most common challenges people face. I’d like to share those solutions with you. By learning simple techniques you can break free from the stress and negativity in your life. I have created a realistic step-by-step program to help you achieve things you only once imagined. Are you physically, emotionally, and mentally overcome by too much stress in your life? Is your sleep, appetite, ability to think clearly and general well-being worsened by all that is overwhelming you? Here is a proven way to go truly get you away from it all to experience your real center. Through this guided meditation you will deeply relax, achieve clarity and greater insight, and find the inner strength to get beyond what is getting you down. Once you release stress you can face the present and free yourself to be able to choose what will bring you to a place of ease rather than dis-ease. Quit tossing and turning and losing night after night of restful, complete sleep. Through this wonderful guided meditation hypnosis audio you will be brought to a state of deep relaxation, release the stresses of the day, and drift off into a full night’s sleep. You’ll awaken refreshed, recharged and able to be clear, focused and present in a new day. Pain wears us down, increases stress, and interferes with all levels of life function. This acclaimed guided meditation hypnosis audio gently, deeply moves you to a place of deep relaxation where you can release and rise above pain, and find a sense of balance, ease and protection. You can access your tremendous power to heal through this holistic guided meditation hypnosis audio, which rebalances body, mind and spirit. Become your healthy, whole self and wonderfully shift your energy to stay in a state of flow and well-being. Successful weight loss requires successful body-mind partnership. This powerful guided meditation hypnosis audio will release stress, return clarity, build self-esteem, and heighten motivation. You will “go the distance” to develop and sustain your ability to achieve your goals and lose the weight permanently, while maintaining a state of balance. You can develop and use your intuition to receive key insights, access greater healing, accelerate spiritual development, and unleash your creative potential. This special two-part guided meditation hypnosis CD opens and extends your intuitive power to provide a critical edge beyond yourself for clarity, problem-solving, and success. This is how to create your dreams and more greatly know your greater Self. The Centering Tools Journaling and Guided Meditation Workbook to Heal Yourself, Empower Your life, and Create Your Best Future is an amazing little coaching book. It takes you on a profoundly transformational inner journey to achieve body, mind and spirit healing, empowerment and evolution. Following the guidelines helps unleash, in many wonderful ways, your own inner power to develop and creatively inspire yourself to achieve your dreams. Close your eyes, settle back in a comfortable position, and let your breath settle. Let Marjorie Baker Price's reflective poems motivate your own spiritual transformation. 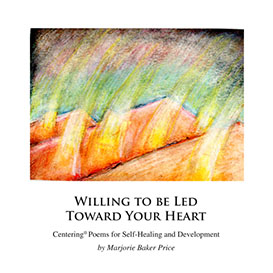 Willing to be Led Towards your Heart is a collection of poems Marjorie spent several years writing. Marjorie conveniently categorizes her poems to aid your own spiritual development. The therapeutic process begins when you start to reflect, and these poems represent Marjorie's own reflective practices. This convenient e-book is an exact copy of the physical book, but at a lower price and a more convenient format. Take it to work, load it in most any portable device, and read and reflect. This unique selection of life stories by four women in their seventies and eighties who developed memoir writing through a monthly memoir writing support group that met with Marjorie’s facilitation for many years to use storytelling as key ways to “touch, teach and pass on” healing, empowerment and greater meaning in our lives. Includes a separate “how-to” section to develop your own memoir writing and more fully express and understand who you are and where you came from. One of the biggest challenges we face as humans is an inability to wade through difficult times. We let stress and anxiety pull us down. If you don't have a teacher the path of self-awareness can become difficult. That is why I have developed the Centering Tools Home Study System. The content of this program comes from my twenty years of experience. It's my best advice for creating a whole new you. Through my own self-enlightenment and studying the greatest self-help masters, I created solutions to the most common challenges people face. I'd like to share those solutions with you. By learning simple techniques you can break free from the stress and negativity in your life. I have created a realistic step-by-step program to help you achieve things you only once imagined. These are the six powerful, easy-to-learn audio downloads so you can get started right away & have access to a back up of your purchase in case the mailed CD's are lost or inaccessible. The Centering Tools Home Study System comes with with a 100% "No Questions & No Hassle" Satisfaction Guarantee. If you get to the end of the program and you aren't completely satisfied that you've created a whole new you, I'll refund your money back with no questions or hassles. This extensive workbook and 2 CD s course teaches you to specifically, successfully develop your intuition to support wellness, empowerment, achievement and evolution in every aspect of your life. This is a wonderful course to partner up and complete with a friend, experience as an extended workshop you can do at your own pace at home, and even use to start your own study group. It includes original affirmations, hypnosis and guided imagery exercises, and special journaling techniques to create your dreams and become a whole new you. Chapter topics include overcoming fear and failure, centering, clearing and focusing your mind, and visioning success. Understanding and committing to yourself allows you to go the distance to achieve your dreams, by utilizing your intuition as your own best coach and miracle maker. Marjorie Baker Price and Ray Justice, the authors who, throughout the course, share their own amazing stories walking the talk of self-healing and creation, personally challenge you to discover the power of your own unique intuition to recover your own best self and life. 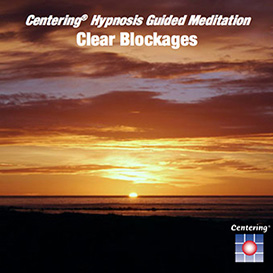 All of our Guided Meditation and Hypnosis Audios are available as mail-order CDs or as instantly downloadable MP3 files. Shipping method for physical products depend on product size and/or customer specifications, as applicable. We add $2.50 US for 1st class shipping, but please contact us if you would like an alternate shipping method or if you are ordering from outside the US. Please click on "Add to Cart" to purchase a physical CD or "Download Now!" to purchase a digital download. Experience this healing guided meditation hypnosis audio to create a soul miracle for you of recovery – your heart’s desire to unconditionally love and accept yourself just as you are. This restores your power to be fully present in the world, to share, respond and create your true intent. You can rise above where you feel caught and stuck – “lesser than” you know you are – to heal and evolve spiritually to birth your greater self as your best guide and ally through this guided meditation hypnosis audio. Are you addicted to a relationship that you know is bad for you? 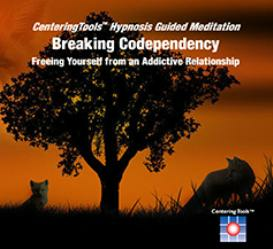 This codependency can be broken at a core level through this powerful self-healing and empowerment guided meditation and hypnosis audio. Take back yourself, your life, and your own indestructible wise spirit for recovery. Your children can release stress and build self-esteem by listening (and you can join them!) to this special guided meditation audio that helps them feel safe and empowered. They will relax and feel more focused and at ease from a greater sense of balance in mind and body, and learn to support themselves from their own special center. Do you feel blocked despite your best efforts to get ahead in your life, fearful that you can never get past what keeps you from what you know is your greater good, and desperate to get out of the box where you feel trapped in repeat circles of experiencing exactly what you don''t want in your life? Does it seem you hopelessly struggle to achieve loving relationships and a true sense of wellness and peace? This breakthrough relaxation and imagery audio centrally clears and lifts you beyond whatever is really blocking you, to experience spiritual protection and body-mind healing, and recover your fully empowered self. Wouldn’t it be wonderful to be able to listen to not one but two guided meditation hypnosis audios in your car to stay clear and centered – and then leave your work behind at the end of the day? These powerful listening exercises continue to release stress and support your continuing to be your own best self, and are especially designed to play in your car while you continue to feel better and better! You can experience body-mind healing at its core level through this special guided meditation hypnosis audio which shifts you away from dis-ease to ease illness to wellness by working with the very patterns of your physical, emotional and mental energies. A very relaxing, rejuvenating listening exercise that will restore your natural rhythms and bring you to space of well-being. A great accompaniment to body work! Self-esteem must build from within, not without. 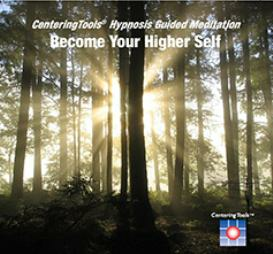 This powerful guided meditation hypnosis audio returns your sense to feel good about yourself to you through centering, with its tremendously uplifting imagery and deeply relaxing support to further release anxiety. From your restored center, you become empowered and free to create your best life. We can send our heartfelt desires for loving partnership into physical reality to support the universe’s capacity, with our own, to manifest what we most want and deserve to have as a mirror of our capacity to lovingly partner with ourselves in how we are and what we experience in the world. This wonderful guided meditation hypnosis audio leads you to both attract and create that soul mate connection. Is it hard for you to let go of the past? Are you tortured knowing that you can''t forgive and forget to free yourself to be truly present and empowered? I have discovered through over twenty years of working with clients suffering from many kinds of trauma stemming from an unhealed past that, in many significant ways, continuing to carry the past physically, emotionally and mentally haunts and damages any capacity to be truly focused and successful in the present. In addition, there is strong evidence through decades of mind-body research that centrally suggests that a lack of forgiveness causes major illnesses and compromises or even prevents recovery. Through this gentle and extended guided meditation you will experience an amazing inner journey of greater understanding where you can forgive and release the past, and finally free and heal yourself to move forward to a lifetime of love and fulfillment. You can, through this acclaimed guided meditation hypnosis audio, experience your spirit guide, who will offer you a whole new dimension of intuition, healing, development, and creation through divine love and power. Better cope and creatively transcend learning disabilities through this powerful guided meditation hypnosis audio to integrate and better balance mental function, and heal stress and emotional trauma associated with struggling. All learning disabilities involve a “scattering” effect which challenges perceptual capacity. Centering offers the key to focus, which in turn support restoring whole function. This acclaimed guided meditation hypnosis recovery audio was especially created over twenty years ago for a chemical dependency treatment program to release stress and sustain sobriety. You can stop using and empower yourself through your own tremendous capacity to self-heal and develop. You can access your tremendous power to heal through this holistic guided meditation hypnosis audio, which re-balances body, mind and spirit. Become your healthy, whole self and wonderfully shift your energy to stay in a state of flow and well-being. This wonderful guided meditation hypnosis audio is for about-to-be-parents: You can open a channel to extend your ability to lovingly communicate with your unborn child, and express and energetically transmit your tremendous love and faith in your new family. You can forge a spiritual bond with your developing baby to fully ready yourselves to welcome your unborn child into the world, and prepare all together for this blessed miracle. Have you ever felt you’ve lived other lifetimes? Experience your soul’s record of extended healing, development and completion to extend healing, creation and development in this lifetime through this transformational guided meditation hypnosis audio. Again and again you can “open the record” of all your experiences to make greater sense of who you are and what you are as a spiritual being of multidimensional consciousness, and find answers to the deep, central questions and challenges of your life. You can make every day count in all the ways you need and want to successfully function in the world from a place of personal power, heightened awareness, and freedom to choose and complete your desires in this acclaimed guided meditation and hypnosis audio. Be in your own greatest flow and achieve and accelerate your greatest purpose, extending balance while sustaining motivation and creativity. Build faith in yourself and know you can do it! 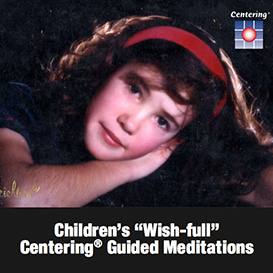 You can heal and develop despite childhood trauma and woundedness to recover your inner child through this wonderful guided meditation hypnosis audio. Your inner child will in turn restore trust, wonder, creative freedom, integration and delight for you to be fully, joyfully present in the world. "build and sustain the inner sense of purpose and certainty that anti-depressants and other pharmacological agents are not designed to promote"
With the smoking cessation audio, you can build and sustain your motivation to stop smoking permanently through the powerful support and guidance offered in this wonderful guided meditation and hypnosis audio. Do you feel caught in an endless replay of an unsuccessful past and powerless to fundamentally change, according to your true desires, to create the life of your dreams? Do you worry about lack of motivation to go the distance in this tremendously accelerated, confusing, challenging and complicated world we live in, to fulfill your real potential? I have developed a simple but transformational guided meditation that unleashes the unlimited power of your imagination to inspire and direct you to identify what you really want, and develop the inner motivation to courageously make it happen in your life. You will learn to wisely, step by step, bring forth your unique greatness. Use the power of hypnosis to break your addictions, restore hope and personal power, and release stress as you gain access to higher awareness and your core motivation to recover! 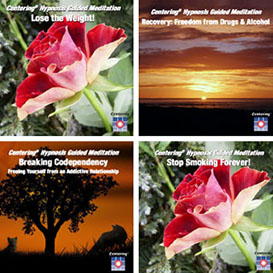 Work with all four audios: Freedom from Drugs and Alcohol, Breaking Codependency – Freeing Yourself from an Addictive Relationship, Lose the Weight, and Stop Smoking Forever. 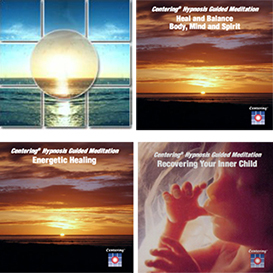 Listen to these hypnosis/guided meditation audios and experience your inner center to extend and unleash your power to heal body, mind and spirit; develop higher awareness; recover self-esteem and personal power; and tap into your intuition to create the life you choose! 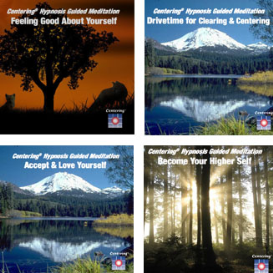 Explore ongoing all four titles: Accept and Love Yourself, Become Your Higher Self, Drivetime for Clearing and Centering, and Feel Good About Yourself. 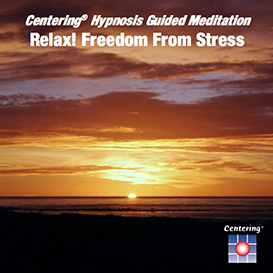 Through these four hypnosis/guided meditation audios you will release stress, pain and anxiety at a core level physically, mentally and emotionally; extend and balance your energy; and achieve overall balance and well-being. Experience the life-changing results of: Clear Blockages, Get a Good Night’s Sleep, Relax! Freedom from Stress, and Release Pain. Heal present and past trauma, and integrate body, mind and spirit, as you recover your greater, fully empowered Self. Release all that gets in the way of living the life of your dreams, and restore a whole new sense of personal balance and well-being through these three hypnosis/guided meditation audios: Energetic Healing; Heal and Balance Body, Mind and Spirit; and Recovering Your Inner Child.